An incredible experience today! All the beekeeping books I’ve read (a fair number by now) try to describe the experience of seeing a hive in action. It’s likely to remain indescribable. I certainly can’t begin to put it into words. One week ago today I brought my nuc home and transferred the girls (probably a few guys as well) to their permanent home. It didn’t take long for me to discover that I needed to modify the protective clothing that I wore, so back to the bee store. Today, I opened the hive to see what was happening inside. (Had friend to take some pictures, too.) As you can see, I’ve opted for different attire–a much nicer experience for me. Still sweaty, but at least not dripping on my veil. 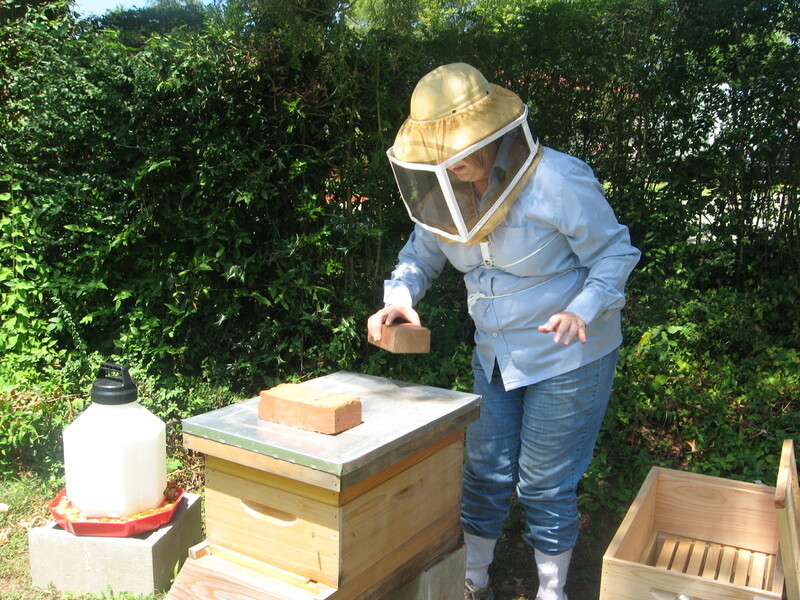 The weather was cooperative–clear, sunny, low humidity (41% and 87 °F reported at the time I opened the hive). I did light a smoker and used it only for a couple of puffs to clear the Miller feeder before taking it off. Last week I did the newspaper-pine needles-punk wood, routine. This week I wussed out and simply used the cotton fiber fuel that you can by from the bee store–such a time-saver, and so much easier. This colony seems rather tolerant of me nosing around so I didn’t put on gloves. There was one point when I was just getting ready to start pulling the frames (after I had removed the first one) when there was an interesting line of bees, all side-by-side, wall-to-wall, in the cracks between the other frames–I definitely did feel I was being watched! They got anther puff of smoke then–given that several of the books say that indicates need for a bit more smoke. I really felt I needed them to move down so I could pull the frames without hurting anyone. Because I’m going to be in and out of the hive about weekly with the new girls getting established and me learning, I switched from the Miller-type hive-top feeder to a Bee Smart feeder today. 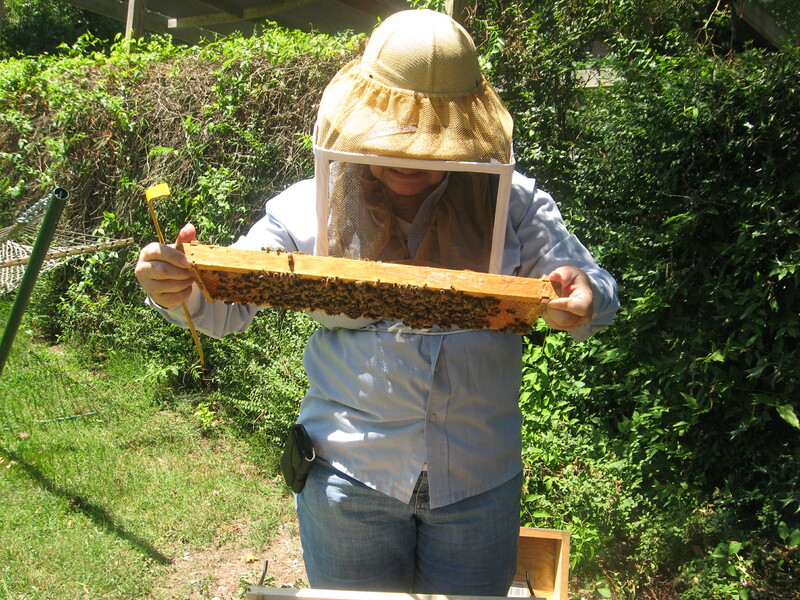 I tried out the Bee Smart in the kitchen sink before toting it out to the hive. The Bee Smart tray filled nicely and didn’t overflow. Fingers crossed because that should be easier than moving the other one each time without slopping sugar water all over the place. After talking with other keepers, I did add Honey-B-Healthy to the feeder. To my very novice eye, things looked good in there. I did see eggs around where the queen was–they are really hard to see–I may add a magnifying lens to my “bee bag” with all the other goodies that accompany me to the hive. I made sure that I did this inspection when the sun was out or I doubt I would have seen eggs. I didn’t see a lot of larvae though. Lots of capped cells. And bees crawling about everywhere…. 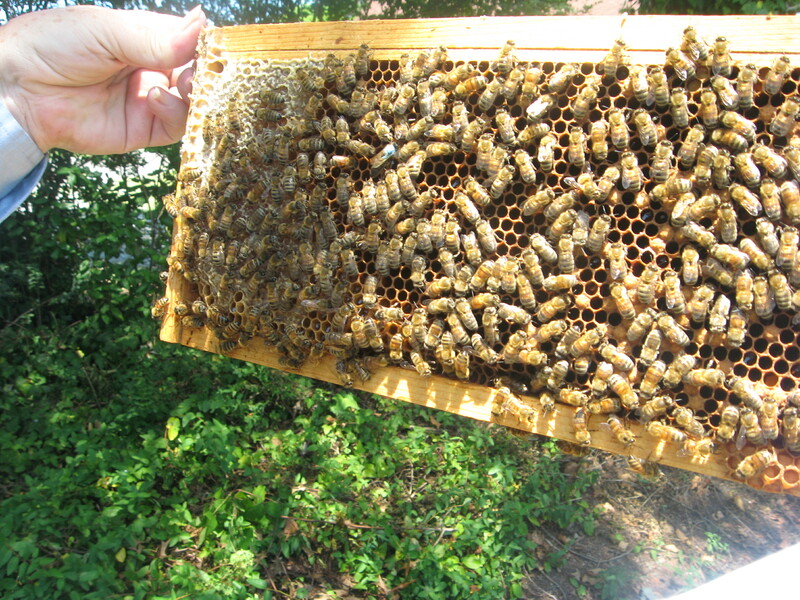 On the left 1/3 of the frame, you see what looks like a white/light blue spot–that’s actually the queen bee (marked with the international standard color). She was moving around slowly on that frame. Soooooo happy to see her in there doing her thing (yes, with effort I did see eggs) after my first adventure with her. 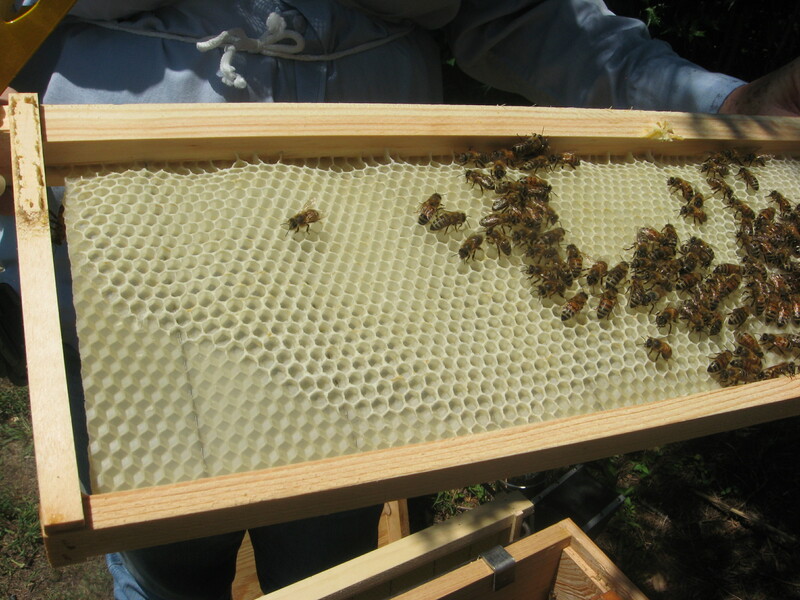 It seemed like every single cell was stuffed with nectar/sugar water/honey in all of the frames from the nuc. Surprised at how much heavier they were when I picked them up today, compared to what I remember from last week., (The hive was certainly heavier (after the feeder was off). With luck it will be heavier still next week. They had started to draw the comb on the unused frames–so it seemed appropriate to add another box–certainly want them to have enough room to do their thing. Now to wait another whole week to see what is happening in there–I really do want to peek sooner, but I’ll refrain, and just deal with the anticipation. Since this was my first go at doing a frame inspection, I didn’t take my tablet or notebook computer out to use Hive Tracks live on the inspection, or for that matter even attempt to use my smart-telephone. That will be added next time. It was certainly wonderful to come in and have the weather entered at the time I started the inspection. I liked the check-things-off approach. I suspect that I got a more complete record than had I been handwriting or even making notes on the computer. Just reading over the inspection form before I actually even lit a smoker helped with organization–which I need badly as a brand new beekeeper! OOPS! Well, a bit of a mishap with the Bee Smart feeder–which may be with the beekeeper. It’s good to read the instructions, but then you do have to follow them if you want something work as promised. 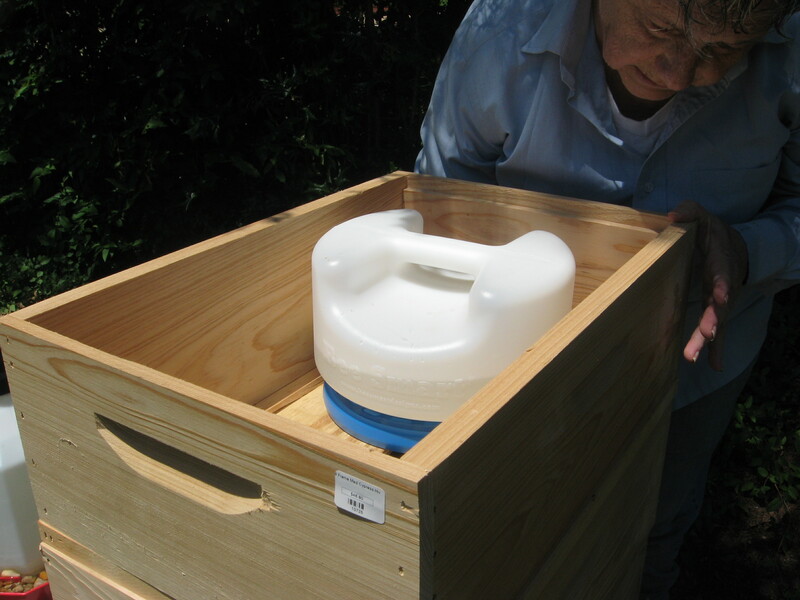 I put feeder in, but neglected to note that “the base can be rotated to adjust the syrup level; since most hives are not level make sure that the syrup stays. . . .” So–some sugar water spilled onto the inner cover, and down the front of the hive. Didn’t run out all that much, and it did not douse the frames. But. . .it did not stop overflowing until I leveled it. Slight movement while trying to adjust it lead to sloshing which lead to more syrup. After leveling it has (right now) quit overflowing. There will be an early morning check on this for sure. Likely an internet search for an alternative just in case. I’m looking for something that fits in a medium super rather than a deep (or two mediums). In my internet searching before I got the Bee Smart feeder, there did seem to be a split: love it or hate it. I talked to users who loved it–I’ll have to wait and see. I might want just a plain simple bucket feeder! This is so fascinating! YOu’re very brave! I’ve always been fascinated by bees and LOVE honey. 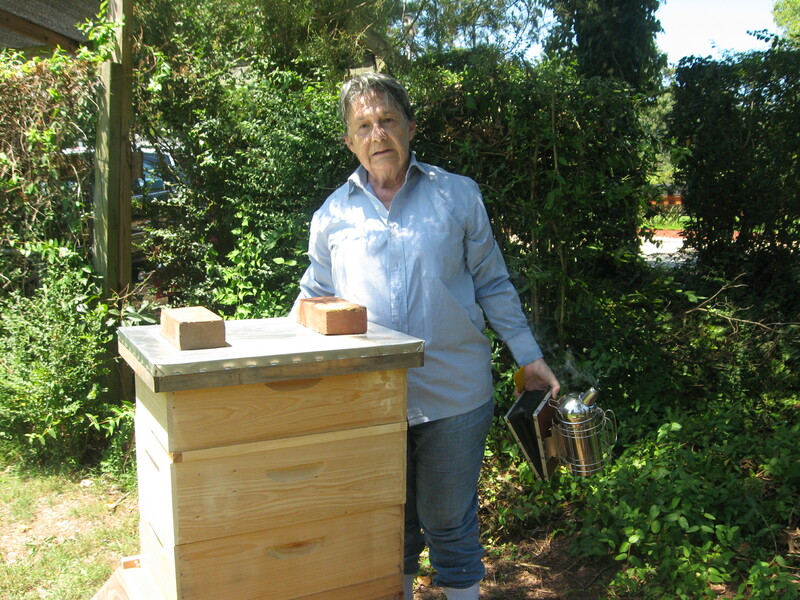 So far this colony seems very gentle–we’ll see how they are when I’m taking away their honey next year. Honey bees really aren’t aggressive.